#142. Wahsatch Mountains, Utah. 14 x 20, oil on canvas. "Gilbert Munger" lower left; "Wahsatch Mts, Gilbert Munger" reverse. This picture shows the present day Alta ski area in Little Cottonwood Canyon near Salt Lake City. The leftmost peak is Sugarloaf and the right-center peak is Mt. Baldy. 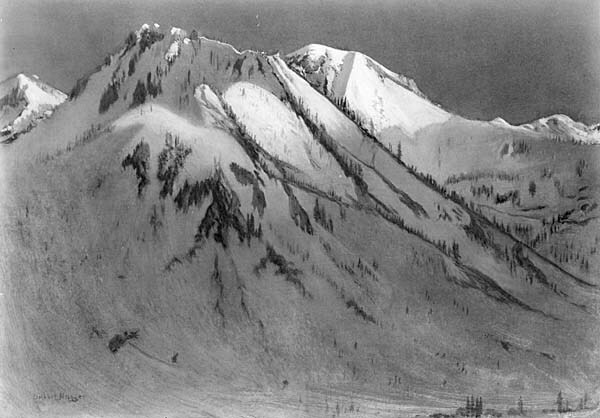 The high ridge on the closest mountain leads at its right end to the "High Rustler" ski run swooping down to the right. Clarence King was called to the Emma mine at Alta in June of 1873 to perform a geological inspection of the property. Munger probably accompanied him there, since his "studies drawn in the neighborhood of the famous Emma mine" were shown in December of 1873 in San Francisco. This picture was at Kennedy Galleries NY in 1973; its present whereabouts are unknown. Image from Kennedy Galleries photo.